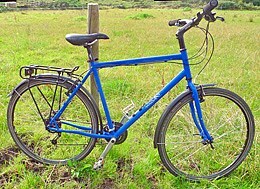 We do offer a range of different bicycle types. 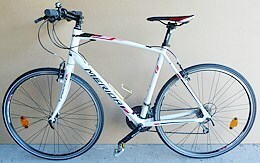 Mountainbikes or pure roadbikes are NOT among them as we believe these types are not suitable. All our bikes cost the same to rent. Should your favourite model not be available in your size we will let you know and make suggestions. Being cyclists by ourselves we know how important a trouble free bike is. 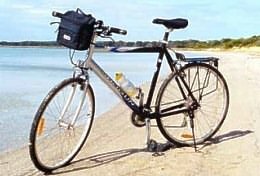 To ensure this all our bikes are fitted with puncture proof tyres and are serviced intensively by an experienced technician before each rental , even when they were out for just a few days. Brake downs are extremely rare. 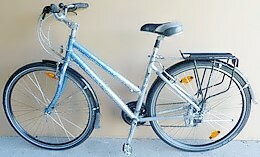 For your peace of mind our bikes are covered by "RACT roadside assist". That means if you have a serious problem, cannot fix it and we can not come you can call the Tasmanian automobilclub and they will help you for free. Each rental comes with a taste neutral waterbottle for each cage, a comprehensive toolbox incl. spare tube, a good pump and one lock for every 2 bikes. Helmets are available on request free of charge (wearing a helmet is compulsary). Despite all these benefits our prices are very low in comparison, in particular if you take into account our prices do include the expensive delivery and pick up if you have booked a tour with us. Please note: Our bikes are NOT suitable for off-road treks or rough gravel roads. Our new TOURERS have been designed and pre-assembled in Germany to our specifications with a lot attention to detail. They may look ordinary, but they are perfect a touring-bike, containing some road bike DNA, extremely agile and easy to move, but also very stable, even with heavy luggage! That is made possible by a frame from double butted Chromoly steel tubes (very rare these days!). 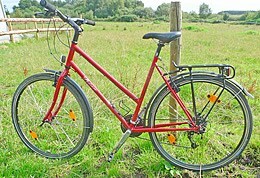 This does not add weight but gives a comfortable ride while more pedalling energy is ending up on the road! Only high quality components are fitted including high precision wheels, low friction cabeling, a rock-solid rack, metal-mudguards and sealed cardridge ball bearings within the fork, pedals and bottom bracket. The first gear is as extremely low as the one on our Shogun Hybrids but the 24 gears system is much more reliable. We can offer these hi-end bikes for our normal rental price as their maintainance cost is much lower. Please note: In order not to spoil the sporty feel no handlebar bag has been fitted. 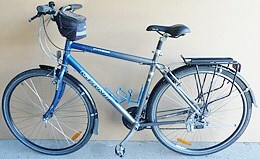 However, a medium size detachable handlebar bag (see picture) can be hired for $ 10 per tour. Weight: around 14 kg, but hey react like a much lighter bike! - strictly for use on paved roads only! There is no Lady frame available! Please note: Should your prefered bike beeing unavailable we will substitute it with one of similar size and type. We aim to inform you as soon as possible. 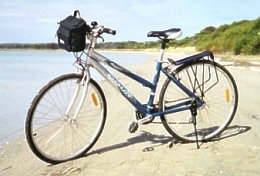 BIKE HIRE WITHOUT TOUR-BOOKING IS AVAILABLE. Please download prices and conditions here.